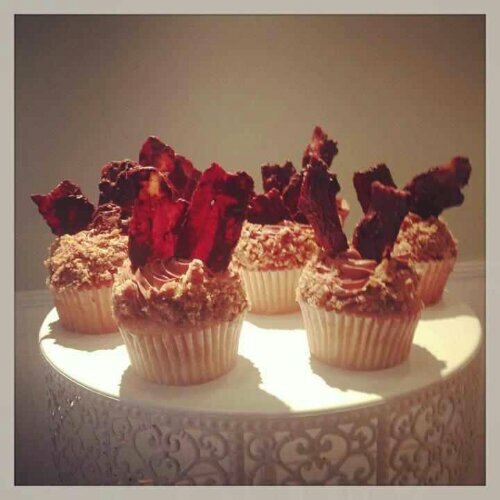 Cinnamon cake with chocolate frosting topped with choclate covered bacon and candied pecans. This ain’t 100% Paleo (pretty damn close though!) and it sure as sh*t ain’t the healthiest snack ever, but sometimes, once in a blue moon, you just gotta say #effit and go hard! This is the moment! The next time you’re in NYC, make it a point to drop by Big Booty Bakery Company. This right here is good food, a great small business with a cheeky way of getting the tastebuds going. Chocolate chip cookies the size of your hand (warm, fresh out the oven! #sigh), cupcakes that fill you up without bloating you out, and sandwiches made-to-order. Really? It MIGHT be a good thing that I’m over 500 miles away.